You know how theoretically there are an infinite amount of colors, well I think I’m seen all of them in “Speed Racer” the new movie by, the Wachowski brothers, the duo that brought as “The Matrix”. 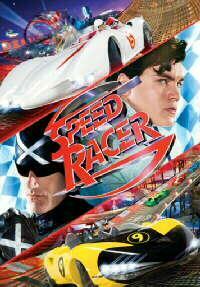 The very colorful movie is based on the1960s Japanese anime series Speed Racer. The brothers haven’t done much since The Matrix Trilogy, except for producing the outstanding “V for Vendetta”, but I still had faith they could do a good job until I started reading all the negative reviews. Honestly, I went in with very low expectations from all the negative reviews I read. However, I’m here to tell you what you’ve been told is a lie, the critics are wrong because Speed Racer is pure unadulterated family entertainment. Speed Racer starts at the very beginning with a young Speed Racer (Nicholas Elia) daydreaming about racing cars which is turn shows an older Speed Racer (Emile Hirsch) racing the Mach 5 remembering his youth. The camera next pans to each family member and a segment of each is revealed giving us a nice breakdown of the back story. This was a very nice technique and it shows the use of the new all in focus technology where everything on the frame is in focus like a cartoon. In this back story, it is revealed that Speed Racer’s brother Rex (Scott Porter) died in a deadly race known as The Crucible. Speed wins the race and as the new rising star is called by Royalton (Roger Allam) a man that controls all aspects of racing and because of it has gain tremendous power and wealth. Unlike this brother, Rex, Speed Racer sticks with his Pops (John Goodman) and doesn’t sign a contract will Royalton. At this point Royalton tells Speed that all the races are fixed and that he controls the outcome. Speed is disillusioned and leaves disappointed but not without Spritle (Paulie Litt ) and Chim Chim causing some major problems. Now Speed and the mysterious Racer X must race together to bring down Royalton. The cast could not have been better, but the casting of the villain, Roger Allam as Royalton and John Goodman as Pops was perfect. John Goodman is Pops and he plays the character flawlessly. Roger Allam plays the villain so deviously here like he did in “V for Vendetta”. Allam knows how to get under our skins. Matthew Fox as Racer X has a flare of the mysterious. Matthew’s ability to portray very little emotion finally paid off and his monotone voice only added to his character’s allure. The special effects were good, however I prefer the special effects where one is not sure if it’s an effect of if it’s real. We that said, the special effect here look like you’re inside a live action cartoon, not bad but a little distracting. The best part of the movie were the fights scenes and the comedy provide via Speed’s little brother. The fight scenes are wacky and like nothing you have ever seen before and even have the Racer family fighting off a bunch of ninjas. The other thing that was also very good was Chim Chim and Spritle. They were the comic relief and if you think they would come off corny, you are way off. They are actually very funny and I think that Chim Chim and Paulie Litt deserve at the very least an MTV movie award nomination. The movie runs about 2 hours and 15 minutes and this is a little too long. There are too many race scenes and at least one could have been cut out or trimmed down. Overall, the movie was fun, funny and provided an entertainment experience that the entire family can enjoy. So this weekend when you’re deciding whether or not to take the kids, take grandma too. I’ll bet she’ll have a blast. SPECIAL FEATURES: The DVD includes two featurettes running around 30 minutes total. I was very surprise to find these featurettes highly entertaining.